Jack was born in 1925 and lived something of a boy’s own life. In his early years he worked on deep sea trawlers for Neale & West; as a police cadet with Cardiff City Police; served four years in the Royal Artillery before working in the dry docks at Cardiff. 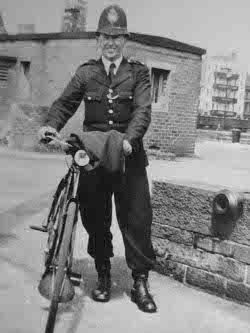 In 1949 he became Police Constable Jack Sullivan in the British Transport Commission Police at Cardiff Docks. In 1955 he joined the Kenya Police and served during the Mau Mau Emergency. Later he transferred to the Bahrain State Police working in intelligence which led on to him joining the Royal Navy with the rank of Lt. Commander RNR, working in Naval Intelligence in the Middle East. When he eventually returned to Cardiff he worked with children and on schools projects in a voluntary capacity. Throughout his life Jack always kept a sketch book by his side and he painted hundreds of scenes depicting the world around him. He painted ships and the sea, people from the community including seamen, dockers and policemen as well as scenes from his years in Africa. 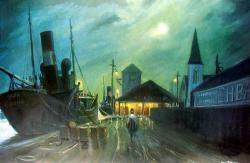 He held many art exhibitions and became one of Cardiff’s best known artists of recent times. 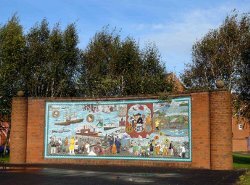 Several books have been written about Jack and his work including the story of the large mural which he designed for Stuart Street, depicting scenes from Butetown and the docks. Another excellent publication displaying many paintings from Cardiff’s docklands is “Tramp Steamers, Seamen & Sailor Town” published by the Butetown History & Arts Centre. Harry Cooke, a friend of Jack’s, was another great character who wrote about the dockland community. All the people in Harry’s world had the same name- “Shipmate”. At one time Harry was janitor of Cymric Buildings in West Bute Street at the docks, a building housing the Headquarters of the British Transport Police South Wales Docks Division. He took a great interest in the force and the history of the Bute Dock Police, writing an article for the force magazine, “The Journal” in 1977. During Jack Sullivan’s time in the dock police the cartoons he drew of amusing incidents became legendary. He had an impish sense of humour and was fond of practical jokes, two of which became part of police folklore. In one, he got hold of a dummy head on which he put his helmet and then balanced it on his own head whilst standing outside the police lodge at the main gate to the docks. With his cape fastened round the ‘neck’ to complete the picture, he not only appeared to be seven feet tall but when a couple of half drunk seamen wandered past returning to their ship, he gave a slight nod and his head fell off. The seamen ran off in terror- what a story they must have had to tell their shipmates! In the second incident, Jack was on his beat when he was instructed to meet Sergeant Charlie Bushell at an appointed time at the top of the East dock. It was evening time and dark when Jack got there a few minutes early. He noticed a beam and finding something dark to stand on, he slung a piece of old rope over the beam and tied a noose around his neck. Still wearing his cape and helmet and with his head tipped to one side, it seemed for all the world as though Pc Jack Sullivan had hung himself. The poor sergeant got the fright of his life when he arrived and was not amused, though he did see the funny side of it eventually.